Vacation rental house. Sleeps 6, 3 bedrooms, 2 bathrooms. Cats, Dogs allowed. 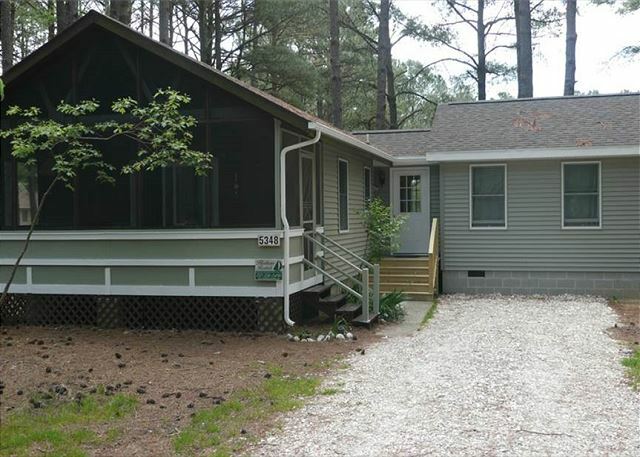 Tucked away in Piney Island, just minutes from Assateague's nature trails and beach, this quaint cottage is perfect for the whole family. With water access for a canoe or a kayak, and pet friendly, you can have it all with this house! A brand new, recently added, Master suite adds space and an extra bathroom to this classic Chincoteague home. Prime Season Rates: $825 weekly/$165 nightly. Off Season Rates: $590 weekly/$118 nightly.